Filo (or phyllo) (Greek: φύλλο "leaf") is a very thin unleavened dough used for making pastries such as baklava and börek in Middle Eastern and Balkan cuisines. Filo-based pastries are made by layering many sheets of filo brushed with olive oil; the pastry is then baked. The current practice of stretching raw dough into paper-thin sheets likely originated in the kitchens of the Topkapı Palace during the time of the Ottoman Empire, based on Central Asian and Romano-Byzantine techniques. 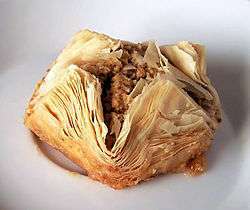 Baklava is probably the earliest dish using filo, and is documented as early as the 13th century. Filo dough is made with flour, water, and a small amount of oil or white vinegar, though some dessert recipes also call for egg yolks. Homemade filo takes time and skill, requiring progressive rolling and stretching to a single thin and very large sheet. A very big table and a long roller are used, with continual flouring between layers to prevent tearing. Machines for producing filo pastry were perfected in the 1970s, and have come to dominate the market. Filo for domestic use is widely available from supermarkets, fresh or frozen. When using filo to make pastries, the thin layers are made by first rolling out the sheets of dough to the final thickness, then brushing them with olive oil, or melted butter for some desserts, and stacking them. This contrasts with puff pastry and croissant doughs, where the layers are stacked into a thick layer of dough, then folded and rolled out multiple times to produce a laminated dough containing thin layers of dough and fat. Very thin pastry sheets can also be made by touching lumps of dough to a hot surface, as in the North African malsouka or by cooking very thin batters, as in the South Indian pootharekulu. Baklava - Layers of filo with chopped nuts, sweetened and held together with syrup or honey. Banitsa - A Bulgarian dish consisting of eggs, cheese and filo baked in the oven. Börek - A savory filo pie originally from the Ottoman Empire. Bougatsa - A type of Greek breakfast pastry. Bülbül yuvası - A Turkish dessert with pistachios and syrup. Bundevara - A Serbian sweet pie filled with pumpkin. Galaktoboureko - A Greek dessert consisting of filo and semolina custard. Gibanica - A Serbian dish made from filo, white cheese, and eggs. Kasseropita - A Greek pie made from filo and kasseri cheese. Pastizz - A savory pastry from Malta filled with ricotta or mushy peas. Spanakopita - A Greek spinach pie. Tiropita - A Greek dish similar to Börek, filled with a cheese-egg mixture. Zelnik - A savory pie from the Balkans. Though filo's roots are in Ottoman cuisine, the English term comes from the Greek name, which means leaf. The Turkish name yufka means both the thin dough used for baklava and börek, and a kind of flatbread, also called sac ekmeği, cooked on a sac, a domed metal plate. The bread form may have been "an early form of filo" since the Kitab Diwan Lughat al-Turk, a dictionary of Turkic dialects by Mahmud Kashgari recorded plated/folded bread as one meaning of the word yuvgha. ↑ Patrick Faas (2003). Around the Roman Table: Food and Feasting in Ancient Rome. Chicago: University of Chicago Press. p. 185. ↑ Alan Davidson (2014). The Oxford Companion to Food. Oxford: Oxford University Press. ISBN 978-0-19-967733-7. p. 307. Engin Akın, Mirsini Lambraki, Kosta Sarıoğlu, Aynı Sofrada İki Ülke: Türk ve Yunan Mutfağı, Istanbul 2003, ISBN 975-458-484-2.